Security Center collects data from your Azure virtual machines (VMs), virtual machine scale sets, IaaS containers and non-Azure (including on-premises) computers to monitor for security vulnerabilities and threats. Data is collected using the Microsoft Monitoring Agent, which reads various security-related configurations and event logs from the machine and copies the data to your workspace for analysis. Examples of such data are: operating system type and version, operating system logs (Windows event logs), running processes, machine name, IP addresses, and logged in user. The Microsoft Monitoring Agent agent also copies crash dump files to your workspace. Data collection is required to provide visibility into missing updates, misconfigured OS security settings, endpoint protection enablement, and health and threat detections. 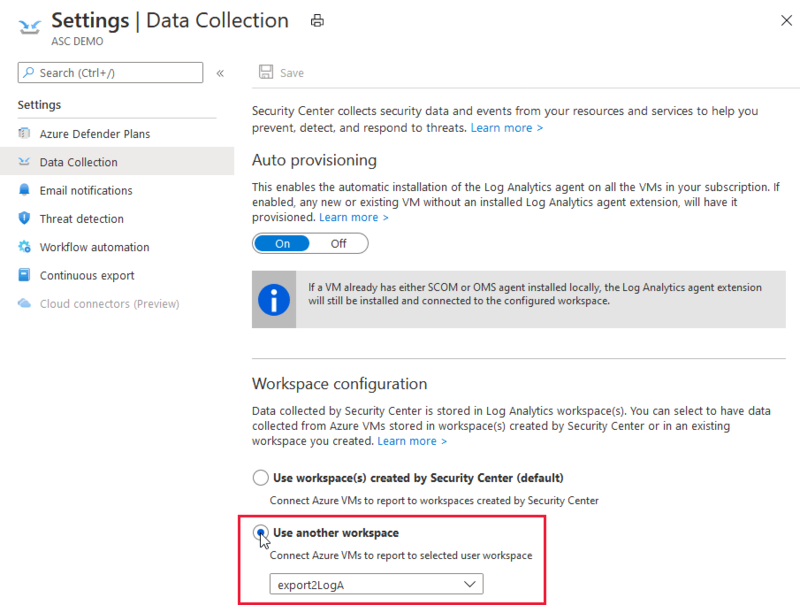 This article provides guidance on how to install a Microsoft Monitoring Agent and set a Log Analytics workspace in which to store the collected data. Both operations are required to enable data collection. Data collection is only needed for Compute resources (VMs, virtual machine scale sets, IaaS containers, and non-Azure computers). You can benefit from Azure Security Center even if you don’t provision agents; however, you will have limited security and the capabilities listed above are not supported. For the list of supported platforms, see Supported platforms in Azure Security Center. Data collection for Virtual machine scale set is not currently supported. Storing data in Log Analytics, whether you use a new or existing workspace, might incur additional charges for data storage, see the pricing page for more details. To collect the data from the machines you should have the Microsoft Monitoring Agent installed. Installation of the agent can be automatically (recommended) or you may choose to install the agent manually. Automatic provisioning is off by default. To set Security Center to install automatic provisioning by default, set it to On. 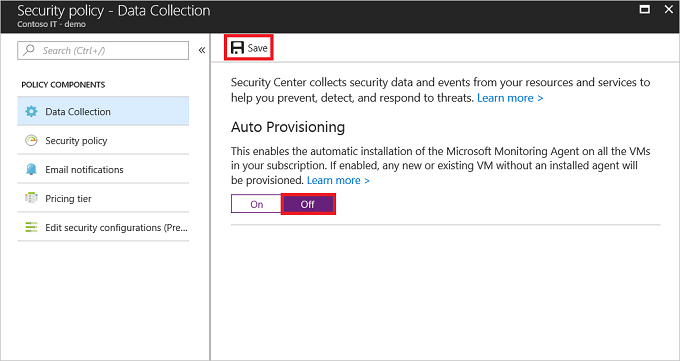 When automatic provisioning is On, Security Center provisions the Microsoft Monitoring agent on all supported Azure VMs and any new ones that are created. Automatic provisioning is strongly recommended but manual agent installation is also available. Learn how to install the Microsoft Monitoring Agent extension. Under the Security Center main menu, select Security policy. Click Edit settings in the Settings column of the desired subscription in the list. Under Security policy, select Data Collection. Under Auto Provisioning, select On to enable automatic provisioning. For instructions on how to provision a pre-existing installation, see Automatic provisioning in cases of a preexisting agent installation. For instructions on manual provisioning, see Install the Microsoft Monitoring Agent extension manually. For instructions on turning off automatic provisioning, see Turn off automatic provisioning. For instructions on how to onboard Security Center using PowerShell, see Automate onboarding of Azure Security Center using PowerShell. Data collected by Security Center is stored in Log Analytics workspace(s). You can select to have data collected from Azure VMs stored in workspaces created by Security Center or in an existing workspace you created. Workspace configuration is set per subscription, and many subscriptions may use the same workspace. Security center can automatically create a default workspace in which to store the data. Under Default workspace configuration, select Use workspace(s) created by Security center. If a subscription contains VMs from multiple geolocations, then Security Center creates multiple workspaces. Multiple workspaces are created to maintain data privacy rules. 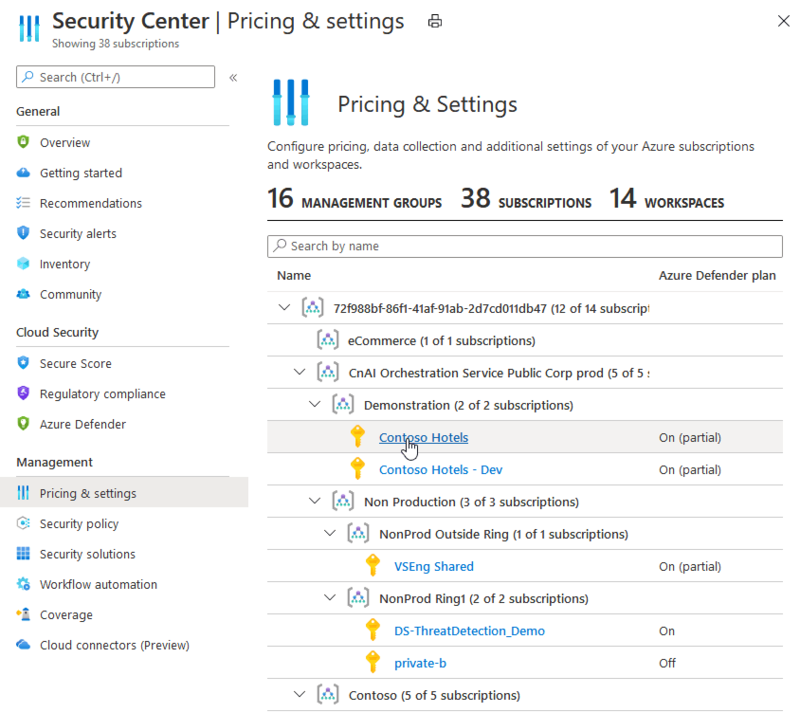 Security Center will automatically enable a Security Center solution on the workspace per the pricing tier set for the subscription. The Log Analytics pricing tier of workspaces created by Security Center does not affect Security Center billing. Security Center billing is always based on your Security Center security policy and the solutions installed on a workspace. For the Free tier, Security Center enables the SecurityCenterFree solution on the default workspace. For the Standard tier, Security Center enables the Security solution on the default workspace. Storing data in Log Analytics might incur additional charges for data storage, see the pricing page for more details. For more information on pricing, see Security Center pricing. For more information about existing log analytics accounts, see Existing log analytics customers. If you already have an existing Log Analytics workspace you might want to use the same workspace. To use your existing Log Analytics workspace, you must have read and write permissions on the workspace. Solutions enabled on the existing workspace will be applied to Azure VMs that are connected to it. For paid solutions, this could result in additional charges. For data privacy considerations, make sure your selected workspace is in the right geographic region. Storing data in log analytics might incur additional charges for data storage, see the pricing page for more details. Under Default workspace configuration, select Use another workspace. From the pull-down menu, select a workspace to store collected data. In the pull down menu, all the workspaces across all of your subscriptions are available. See cross subscription workspace selection for more information. You must have permission to access the workspace. After selecting Save, you will be asked if you would like to reconfigure monitored VMs that were previously connected to a default workspace. Select No if you want the new workspace settings to apply on new VMs only. The new workspace settings only apply to new agent installations; newly discovered VMs that do not have the Microsoft Monitoring Agent installed. Select Yes if you want the new workspace settings to apply on all VMs. In addition, every VM connected to a Security Center created workspace is reconnected to the new target workspace. If you select Yes, you must not delete the workspace(s) created by Security Center until all VMs have been reconnected to the new target workspace. This operation fails if a workspace is deleted too early. Select Cancel to cancel the operation. 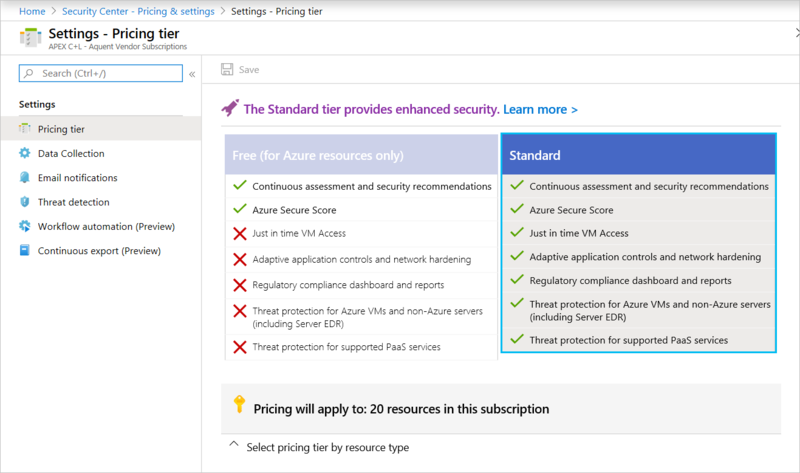 Select the pricing tier for the desired workspace you intend to set the Microsoft Monitoring agent. To use an existing workspace, set the pricing tier for the workspace. This will install a security Center solution on the workspace if one is not already present. a. 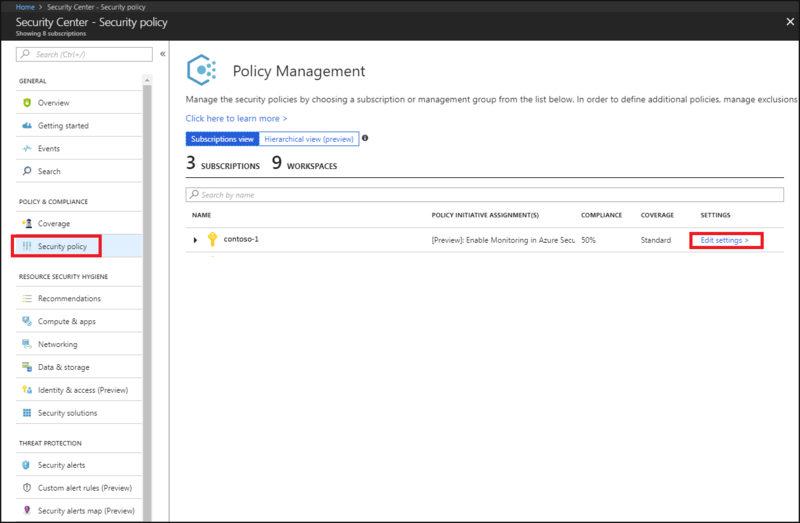 In the Security Center main menu, select Security policy. b. Select the desired Workspace in which you intend to connect the agent by clicking Edit settings in the Settings column of the desired subscription in the list. c. Set the pricing tier. If the workspace already has a Security or SecurityCenterFree solution enabled, the pricing will be set automatically. When you select a workspace in which to store your data, all the workspaces across all your subscriptions are available. Cross-subscription workspace selection allows you to collect data from virtual machines running in different subscriptions and store it in the workspace of your choice. This selection is useful if you are using a centralized workspace in your organization and want to use it for security data collection. For more information on how to manage workspaces, see Manage workspace access. 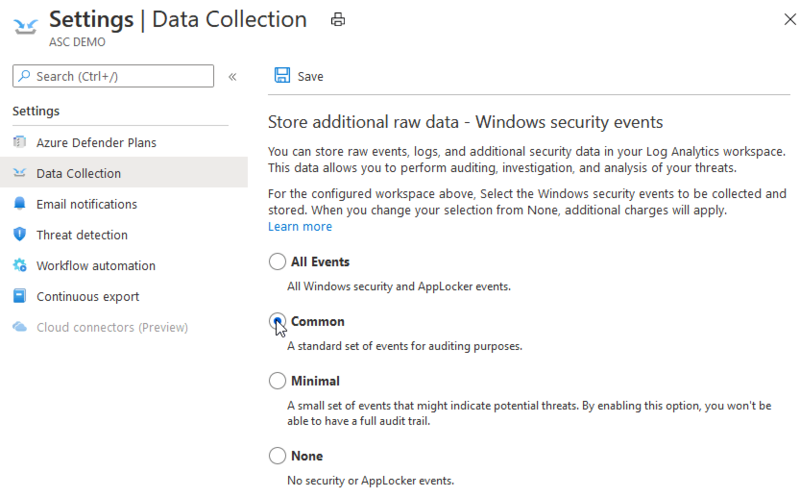 Selecting a data collection tier in Azure Security Center will only affect the storage of security events in your Log Analytics workspace. The Log Analytics agent will still collect and analyze the security events required for Azure Security Center’s threat detections, regardless of which tier of security events you choose to store in your Log Analytics workspace (if any). Choosing to store security events in your workspace will enable investigation, search, and auditing of those events in your workspace. Storing data in log analytics might incur additional charges for data storage, see the pricing page for more details. None – Disable security event storage. This is the default setting. Minimal – A smaller set of events for customers who want to minimize the event volume. Common – This is a set of events that satisfies most customers and allows them a full audit trail. All events – For customers who want to make sure all events are stored. These security events sets are available only on Security Center’s Standard tier. See Pricing to learn more about Security Center's pricing tiers. These sets were designed to address typical scenarios. Make sure to evaluate which one fits your needs before implementing it. Minimal - Make sure that this set covers only events that might indicate a successful breach and important events that have a very low volume. For example, this set contains user successful and failed login (event IDs 4624, 4625), but it doesn’t contain logout which is important for auditing but not meaningful for detection and has relatively high volume. Most of the data volume of this set is the login events and process creation event (event ID 4688). Common - Provide a full user audit trail in this set. For example, this set contains both user logins and user logoff (event ID 4634). We include auditing actions like security group changes, key domain controller Kerberos operations, and other events that are recommended by industry organizations. Events that have very low volume were included in the Common set as the main motivation to choose it over all the events is to reduce the volume and not to filter out specific events. If you are using Group Policy Object (GPO), it is recommended that you enable audit policies Process Creation Event 4688 and the CommandLine field inside event 4688. For more information about Process Creation Event 4688, see Security Center's FAQ. For more information about these audit policies, see Audit Policy Recommendations. To enable data collection for Adaptive Application Controls, Security Center configures a local AppLocker policy in Audit mode to allow all applications. This will cause AppLocker to generate events which are then collected and leveraged by Security Center. It is important to note that this policy will not be configured on any machines on which there is already a configured AppLocker policy. On the Security policy Data Collection blade, select your filtering policy under Security Events. The following use cases specify how automatic provision works in cases when there is already an agent or extension installed. If the Microsoft Monitoring Agent is installed directly on the VM (not as an Azure extension), Security Center will install the Microsoft Monitoring Agent extension, and may upgrade the Microsoft Monitoring agent to the latest version. The agent installed will continue to report to its already configured workspace(s), and additionally will report to the workspace configured in Security Center (Multi-homing is supported). If the configured workspace is a user workspace (not Security Center's default workspace), then you will need to install the "security/"securityFree" solution on it for Security Center to start processing events from VMs and computers reporting to that workspace. For existing machines on subscriptions onboarded to Security Center before 2019-03-17, when an existing agent will be detected, the Microsoft Monitoring Agent extension will not be installed and the machine will not be affected. For these machines, see to the "Resolve monitoring agent health issues on your machines" recommendation to resolve the agent installation issues on these machines. Security center will install the Microsoft Monitoring Agent extension side-by-side to the existing Operations Manager. The existing Operations Manager agent will continue to report to the Operations Manager server normally. Note that the Operations Manager agent and Microsoft Monitoring Agent share common run-time libraries, which will be updated to the latest version during this process. Note - If Operations Manager agent version 2012 is installed, do not turn automatic provisioning On. When the Monitoring Agent is installed as an extension, the extension configuration allows reporting to only a single workspace. Security Center does not override existing connections to user workspaces. Security Center will store security data from the VM in the workspace already connected, provided that the "security" or "securityFree" solution has been installed on it. Security Center may upgrade the extension version to the latest version in this process. 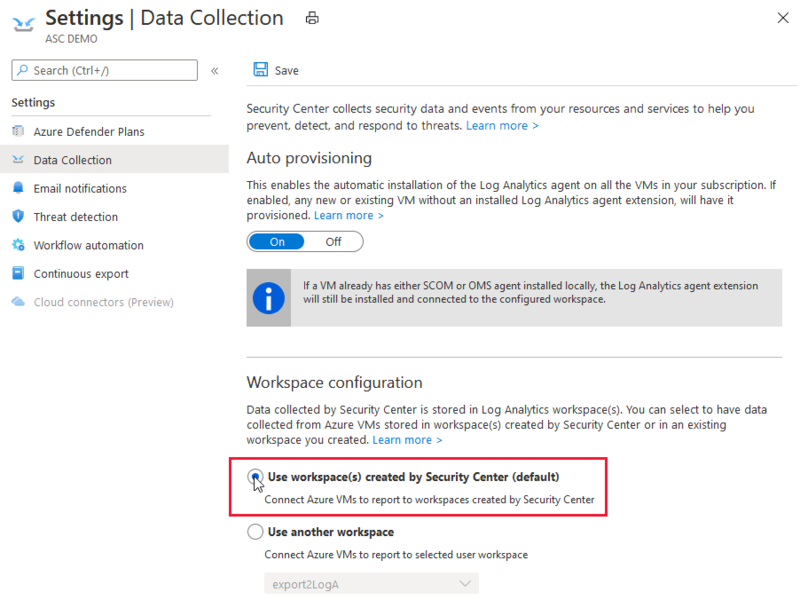 To see to which workspace the existing extension is sending data to, run the test to Validate connectivity with Azure Security Center. 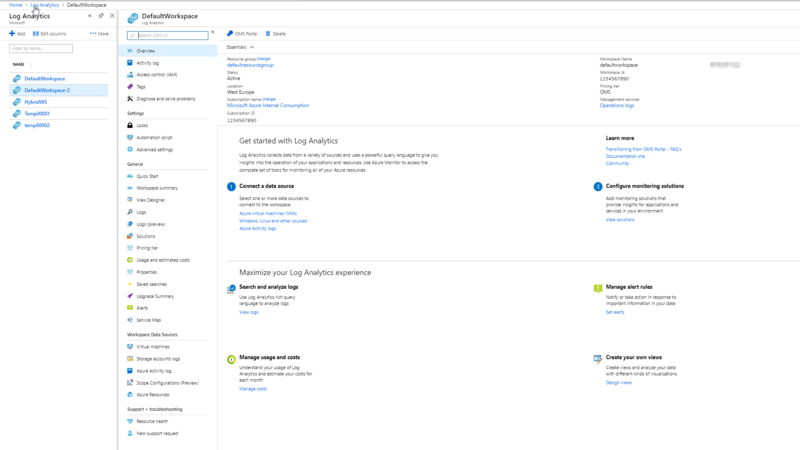 Alternatively, you can open Log Analytics workspaces, select a workspace, select the VM, and look at the Log Analytics agent connection. If you have an environment where the Log Analytics agent is installed on client workstations and reporting to an existing Log Analytics workspace, review the list of operating systems supported by Azure Security Center to make sure your operating system is supported, and see Existing log analytics customers for more information. You can turn off automatic provisioning from resources at any time by turning off this setting in the security policy. Return to the Security Center main menu and select the Security policy. Click Edit settings in the row of the subscription for which you want to disable automatic provisioning. On the Security policy – Data Collection blade, under Auto provisioning select Off. When auto provisioning is disabled (turned off), the default workspace configuration section is not displayed. Agents will not be provisioned on new VMs. Security Center stops collecting data from the default workspace. Disabling automatic provisioning does not remove the Microsoft Monitoring Agent from Azure VMs where the agent was provisioned. For information on removing the OMS extension, see How do I remove OMS extensions installed by Security Center. 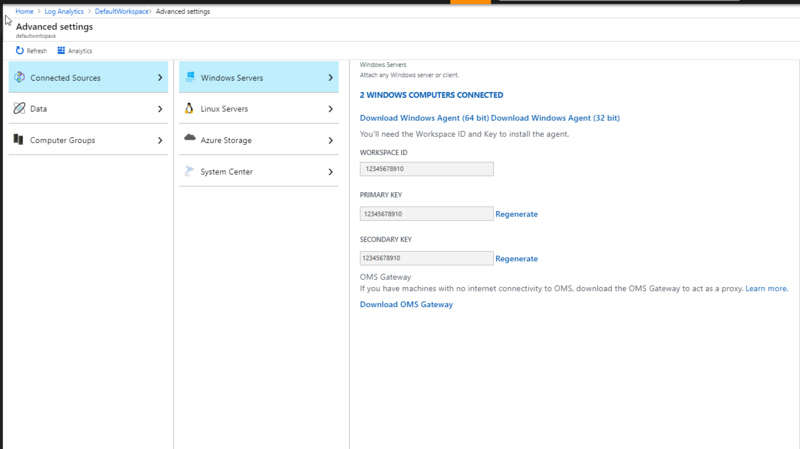 There are several ways to install the Microsoft Monitoring Agent manually. When installing manually, make sure you disable auto provisioning. You can manually install the Microsoft Monitoring Agent, so Security Center can collect security data from your VMs and provide recommendations and alerts. Select Auto provision – OFF. b. Select the Workspace in which you intend to connect the agent. Make sure the workspace is in the same subscription you use in Security Center and that you have read/write permissions on the workspace. 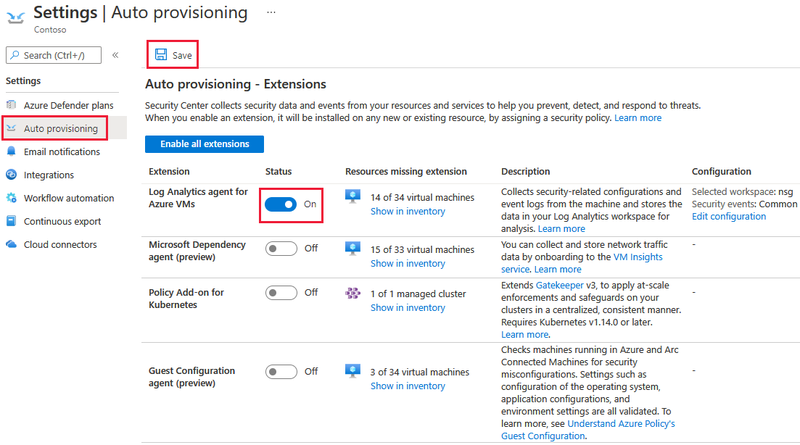 To deploy the extensions on existing VMs, follow the instructions in Collect data about Azure Virtual Machines. The section Collect event and performance data is optional. Go to Log Analytics and click on Advanced settings. Copy the values out of WorkspaceID and Primary key. To identify automatic provision installation issues, see Monitoring agent health issues. To identify monitoring agent network requirements, see Troubleshooting monitoring agent network requirements. To identify manual onboarding issues, see How to troubleshoot Operations Management Suite onboarding issues. To identify Unmonitored VMs and computers issues, see Unmonitored VMs and computers. Azure Security Center FAQ--Find frequently asked questions about using the service. Security health monitoring in Azure Security Center--Learn how to monitor the health of your Azure resources.